The roots increase in thickness by the formation of secondary vascular tissues. The secondary vascular tissues are produced by the activity of the vascular cambium. It produces the secondary xylem towards the inner side and secondaryphloem towards the outer side. Secondary growth is common in gymnosperms and dicotyledonous roots. But it is absent in herbaceous dicots and monocots. Role of parenchymatous cells: The strip of parenchnmatous cells between the phloem and xylem becomes meristematic. It is believed that these cells are the remnants of the meristematic cells of the procambial strands. They remain inactive till the start of secondary growth.The cambium ring is wavy in outline in the begning.This outline varies in different roots according to the number of protoxylem ridges. The cambial cells just inner to the phloem becomes active earlier. Gradually the cambium ring takes a circular form. The cells of the cambium divide to produce new cells towards the inner and towards the outer side. Role of pericycle cells: Some pericyclic cells also become mcristematic. They produce parenchyma cells towards both sides. It forms wide rays opposite the protoxylem groups. Narrow rays are produced by other parts of the cambium. These rays are much wider than the rays of the stem. 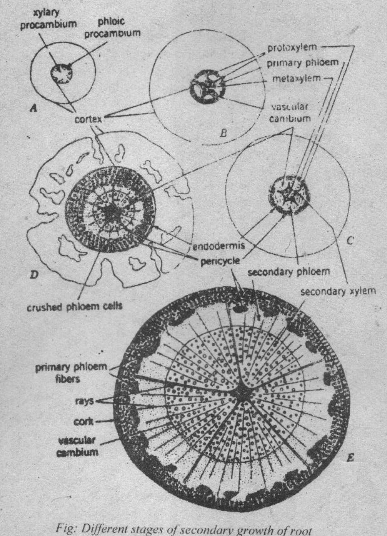 The rays in the roots extend throughout the whole width of secondary xylem and secondary phloem. Cork cambium or phellogen: Me stress of secondary growth ruptures the whole cortex. Therefore. the cork cambium arises in the pericycle. Sometimes. nevi cork cambium arises in deeper layers. it sloughs off the old periderm in the form of bark. I.enticels are not produced in the periderm of roots. Cork or phellem: The activity of the cork cambium produces radial files of cells towards the outer side. These cells undergo suberization and develop into cork cells. Phelloderm: The cork cambium also produces some phelloderm (Parenchyma cells) tosvards the inner side. But this phelloderm is not clearly differentiated. It merges with outer part of the non­functional phloem and remaining pericycle. The storage roots are formed in plants like carrot, beet. seat potato. radish. turnip etc. •their roots become thick due to the secondary growth. It occurs due to the production of successive cambium rings outside the old tissues. Or there may be several small cambial rings outside the old tissues. These roots have extensive parenchyma and few tracheal elements. These tracheal elements are loosely scattered in the storage parenchyma. The parenchyma cells are rich in stored food materials. Therefore. they are often called storage parenchyma.